FOXBOROUOGH, Mass. 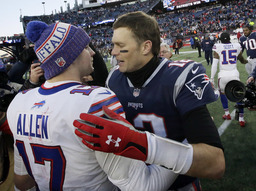 (AP) The New England Patriots earned their 10th straight AFC East title with Sony Michel running for 116 yards and a touchdown in a 24-12 victory over the Buffalo Bills 24-12 on Sunday. With the Eagles win over the Texans, the Patriots are back in the No. 2 spot in the AFC. A Patriots win over the Jets next week would give New England a first-round bye in the playoffs. New England improved to 7-0 at home this season and became the first franchise in NFL history to earn playoff berths in 10 straight seasons. 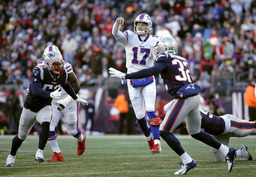 It also marked the Patriots' fifth straight win over the Bills and their 26th series sweep of Buffalo. 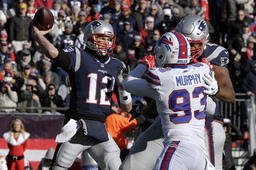 Brady went 13 of 24 for 126 yards, a touchdown and two interceptions - his lowest output since he passed for 123 yards in a 2003 loss to the Bills. 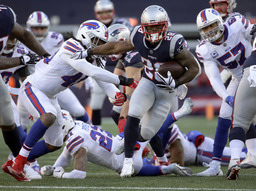 The Bills got back running back LeSean McCoy after a one-game absence with a left hamstring injury. He had a quiet return, rushing six times for 9 yards.